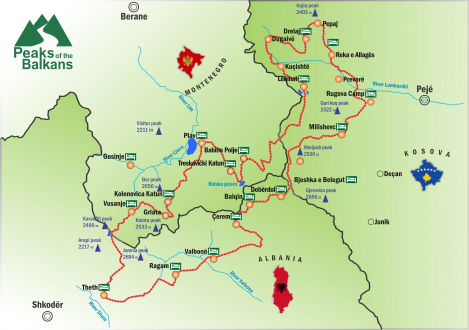 The quite ambitious “The Peaks of the Balkans” trail comprises 192km and completes the circuit crossing the three countries. The hike can be started in each country: Theth (Albania), Plav (Montenegro), or in a small town of Peja (Kosovo). 10 stages of the trail can be hiked in 10 to 12 days depending on the motivation and condition of the hikers. The level of difficulty ranges from easy to moderate, but requires good physical condition and mountain equipment (e.g. hiking boots, waterproof clothing lamp, GPS, first aid kit, mobile phone). Even though the whole is marked and signposted, it partly leads to uninhabited mountain region. Hence, it is recommended to hike in a group or accompanied by a hiking guide. Local mountain guide, trained by the DAV (Deutscher Alpen Verein) and familiar with the trail, are ready to accompany individuals and small groups. 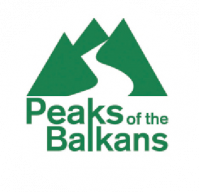 Further information on guides, accommodation, cross border procedures and a detail description of the trail stage, including GPS data and high profiles, can be found on the website (www.peaksofthebalkans.com). The region of Dinaric Alps spreading across the north of Albania, the southwest of Kosovo, and the east of Montenegro which is also called “ Accursed Mountains”, counts to the least known areas in South East Europe. Until now, the mountain region of Kosovo, Montenegro and Albania has virtually remained untouched and is only sparsely inhabited. Thus, it has preserved its fascination and authentic character. The region is known for hospitality of its habitants, which visitors can enjoy while staying in one of the traditional houses that can be found along the trail in all three countries. The variety of accommodation ranges from traditional stone houses, so called “Kullas” , to mountain huts and small mountain lodges where local and house-made dishes are served by the local hosts.